Sometimes the fresh fruit that we want to eat is unavailable where we live, out of season, or we worry that it will go bad before we eat it. So, we opt for dried fruit instead because not only does it have a longer shelf life, but it’s always available. Plus, there are so many options. Raisins, prunes, dates, apples, apricots, bananas, cranberries, kiwis and mangoes are just some of the options you might find. How is dried fruit different than fresh fruit? Drying fruit to preserve it is a practice that has existed for centuries. It used to be that the fruit was dried by placing it in the sun. Nowadays, there is also the option of passing forced hot air over it using a food dehydrator. Either way, what you end up with is a fruit that has about 80% less water content than it did before. This results in a fruit that has a stronger taste and a higher concentration of nutrients. Like fresh fruit, dried fruit provides a rich source of dietary fiber, iron, copper, potassium, calcium, vitamin A, vitamin B’s, and sometimes beta carotene. However, be aware that dried fruit loses most of its vitamin C when it is dried. So, if you want the vitamin C, you should stick to fresh fruit. Apples: Fresh apples have about 57 calories, while dried ones have about 200. 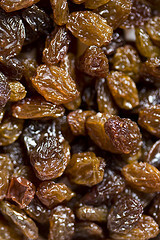 Grapes/Raisins: Grapes have about 60 calories, while raisins have about 430. Apricots: Fresh apricots have about 80 calories, while dried ones have about 310. Thinking about how many more calories a dried fruit contains than an equal weight of fresh fruit is not the only concern. Make sure to read the nutrition labels because you also want to choose a dried fruit that has not been glazed or had sugar added. These added sugars add empty calories that you don’t need. And if you have asthma or are sensitive to sulfur, make sure that the nutrition label doesn’t list sulfur dioxide. Sulfite preservatives are mainly used to keep the fruit from turning brown, so that the color will be more appealing. So, there’s no nutritional benefit, but it can potentially be harmful to some individuals. If you are having a hard time finding a sulfur free version of your favorite dried fruit, try the organic version. Organic dried fruits are produced without sulfur dioxide. How can I eat dried fruits? On their own: They are a wonderful snack when you are on the go. Boxes of raisins are one of the most popular dried fruits to eat this way. In baked items: Dried fruit can be found in scones, cakes, cookies and granola. Dried cranberries are an especially popular addition to many baked items. With breakfast cereals: Raisins and sometimes banana chips are very popular dried fruits to add to a bowl of cereal. Dried fruits are a great substitute for fresh fruit when you are on the go or are unable to get the fruits fresh, such as when you’re camping or back packing. However, be aware that when you eat dried fruit you are getting a food that is relatively dense in calories. So, if you’re watching your calories, be aware of how many pieces of dried fruit you eat. If you pay attention, you can easily get the nutrients you’re looking for without a surprising amount of calories! Great article! Good to know as I include dried cherries, raspberries and cranberries to my son’s cereal. But I also make sure that he eats a fresh fruit daily. Very informative article. I agree dried fruits are great once in a while, but it’s hard to beat fresh fruit. Thanks for the great post! I have a weakness for dates which is a remnant of my sugar tooth when I was young, but I make sure to only get them on occasion. Hola, Talli! Excellent post, explaining dried fruit. I really love, love currants.